Former Uxbridge Bruins Justin Bean was signed by the Belleville Bulls of the OHL on Friday Aug. 31st. 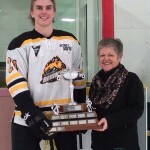 Justin was the Bruins Rookie of the Year as well as the Central Ontario Rookie of the Year seen in photo accepting from Trophy from Convenor Liz Bassinger this past season. The Uxbridge Bruins players, Staff and Executive congratulate Justin and wish him continued success.